A 4.5lb brown trout taken on a size 14 Hairwing Adams. 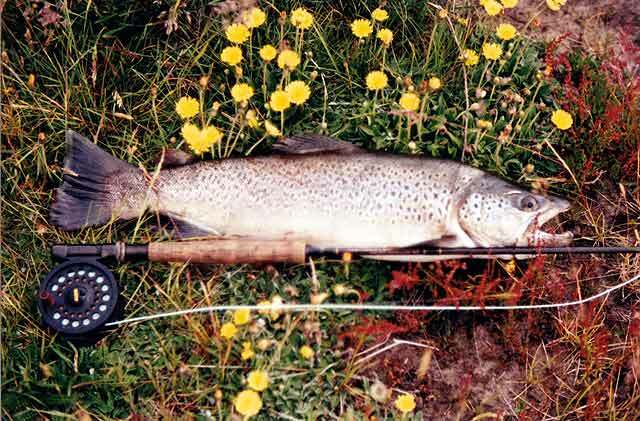 Some years ago a group from the Canterbury Fly Fishing Club had been spending Easter at Twizel, fishing the local waters without much success. On the way back to Christchurch two members decided to fish a spot on the Grays River – a river that had been described by a friend. Leaving the Tekapo River at the Iron Bridge where they had been fishing up until to lunchtime the pair set off. After passing through the camping ground at Haldon they turned north towards Burke’s Pass. Following the directions provided by Alister’s friend the two turned into the Grays River at what they thought must be the right spot. After connecting rods, reels and lines they passed through a gate and walked a short distance to the stream. A convenient bridge allowed for the two to split up. One on each bank, they carefully stalked upstream. The Gray is a smallish spring feed stream that twists and turns through tussocky, swampy grazing land. It had plenty of weed and grass along the edges and banks, with the odd willow to provide cover. Two small fish were spooked downstream, as the pair slowly worked their way upstream. Then their luck changed. The left bank fisher spotted a swirling rise and called to the right bank fisher to have a cast, as he was better situated. After two or three good casts to the right area, nothing came up. Right bank fisher moved away. So the left bank fisher rose up from his hiding place in the long grass to cast upstream, in close to the bank. First cast with a size 14 Royal Wulff. But no response. The second cast settled as gently as an angel’s kiss. It drifted drag free for only a couple of feet when up from the black water swam a shape, sipped the Wulff, swirled and turned down. With a lift of the rod and the hook set, the slack was taken up, and the reel screamed. “Good Fish,” left bank fisher called out. “Five pounds, I’d say.” That turned out to be conservative. The struggle that followed went up and down between two shallow riffles on a bend of the stream, containing three holes with a fallen bank between. To add to the interest a dead willow limb of some 2 to 3 meters was tucked into the bank just below the surface. As the battle dragged on, the 5 to 6 wt, 8 foot 6 inch Daiwa graphite almost completed a full circle. Just below the surface the fish appeared and rolled on the leader and it looked like the 6-pound tippet would go, but luckily the fish rolled back again. Up, down, up, down from one end of the bend of the other until the crafty brown forced it’s way under the tree limb, between two large clods of fallen bank. Firmly wedged under the bank with the leader grating over the submerged limb it looked like the fish would win. Left bank fish fighter had an inspiration! He called a change of position with right bank mate who had been waiting for an opportunity to net the fish. “I’ll come across the riffle below the fish to your side. You come across to my side” with pressure maintained by both fish and fisher the change-over was made. Then the fisher’s mate climbed down onto a shaky perch and began to remove the offending branch. During the struggle with the branch, it looked possible that the fisher’s mate and a larger section of the bank would fall and join the trout. With strength and dexterity, fisher’s mate removed the branch; his contribution to stream enhancement. A tiring angler was able to ease the crafty fish from its sanctuary out into the stream, and with it came a couple of kilos of chickweed and cress – more heart-stopping stress on the leader! From there it was short work to ease the fish up into a small backwater and the net. There it was! A large brown jack in beautiful condition. It was 70 cm of brown spots and buttery yellow flanks. Photos were taken, Wulff removed and the fish held into the flow until it recovered, and moved slowly forward, turned and flashed away. After the adrenaline rush had subsided the happy anger and his mate moved off. A few more casts upstream, then it was time to head north. That short stop on the way home at the Grays River turned a fishless long weekend into a magic moment that will live long in the memory of a happy angler. Article by Fly Struck. Haldon Arm of Lake Benmore in the background. 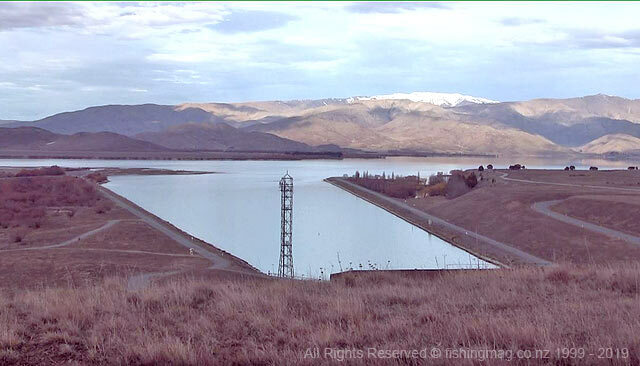 The end of the Ohau Canal in the foreground. The Haldon Camping Ground is just to the right of the centre of the photograph protected by trees. A week in my favourite fishing area, the Mackenzie Country. Well, that’s what I thought I would have but the weather determined otherwise. When I arrived at Twizel on Sunday night I checked into a cabin at the Ruataniwha Camping Grounds. Next morning things looked good. I called on Gary and Mary Payne at The Fly Hatchery, their fly tying business, for a restock and the latest information. Then I headed down to the Kelland Ponds, a place of previous frustration for me. 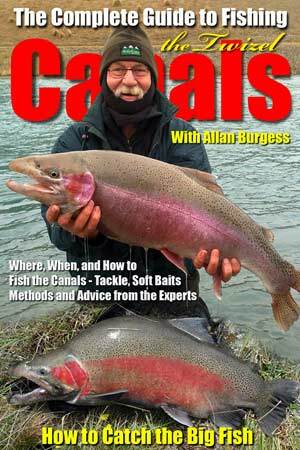 On several occasions in the past, I have either hooked and lost fish or spent time stalking in utter futility. Yet this is the very thing that draws me back there. One day…one day… I will land a good one there. And why should this Monday be any different? Again I spotted several cruising browns, crafty fish that travel quickly along open stretches where they have plenty of unbroken vision. They were taking red damsel or dragonﬂies off the surface and in the air. The ﬂies were mating – a veritable cornucopia of copulation. So a quick search in the ﬂy box – nothing to match. The nearest I could find was a deer hair grasshopper pattern with red legs. No good. I tried it all right. The natural ﬂies seemed to like it, as one tried to mate with it, but the trout ignored it. I did get one small brown to rise to an Adams, but I missed the strike. Later on, I was relating this vision of coupling damsels to Gary Payne and he told me of an American client that he had who had also experienced this phenomenon. Gary provided him with a pattern which was used with success. That success was reliant upon the sexual appetite of the natural ﬂy, for as his imitation sat on the water unnoticed by trout it was eventually spied by a ﬂy who alighted upon it. That was when it became appealing to a trout and both natural and imitation were slurped, the trout was duly played and landed. Well, no such luck for me, so back for lunch and give the good old Ohau Canal a try at the salmon farm. After about an hour of spin ﬁshing, I had a nice rainbow of about 5lb on the rocks. That was as far as it got, for as I was about to slip the net under it, it slipped the Devil out. Goodbye fish. Well, why not fish the Twizel mouth in the late afternoon? So down the bony shingle track, I went in four-wheel drive. It was pleasing to see so much aquatic life in the stream and there were fish moving well out in midstream. I had a very pleasant time casting to seen fish and getting an occasional take from smallish ﬁsh, but no real success. That night back in the cabin after a good meal at the pub, I resolved to give the Tekapo a good try the next morning. Tuesday morning came and the sky looked grey to the south and a bit of breeze was up. Never mind, off to the Tekapo. After turning off at the Pukaki spillway and heading down towards the Iron Bridge the grey sky became black. The black became streaked with ﬂashes of blue-white light. I drove into the most incredible electric storm I have encountered in this country. The hail sheeted down in marble-sized pellets. By the time I got to the Iron Bridge at a snail’s pace, I had decided to call off my week’s trip. The Tekapo was already raging. I pressed on to the camping ground at Haldon, passing through what looked like a winter scene. Hailstones were 4 to 6 inches deep through the ﬂat country, which looked like a white sheet with stripped bare briar brambles poking up. By the time I had ﬁnished eating my lunch in the shelter at the Haldon Camping Ground the hail had stopped and just a steady rain was falling. So, into the Subaru and head north to Burke’s Pass. After a while, about twenty minutes, I drove clear of the rain. In fact, the road was dusty. Maybe I could salvage something after all. The Grays! minutes I saw my first rise. Right-hand bank, behind a willow, close in. I tied on a size 14 hairwing Adams. The second cast was right on. 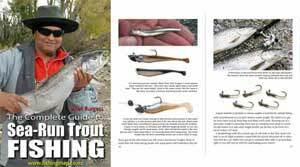 The trout rose, snout half out of the water, to take the fly. It was on! Luckily the ﬁsh came downstream about half the distance from the willow to me. Had it gone for the willow it would have been safe. I kept the fish in midstream and under control, then it swung down and into the bank. I kept the pressure on and got below it with the net. Up it came. With the fish still in the net, I weighed it, 5lb of golden brown. The same buttery yellow as the 7.5lb brown I had caught the previous Easter with Alister. I had left the camera in the car. I was tempted to keep the fish, but thought better of it, slipped the Adams out and released it. I moved on about 50 metres, walking slowly. There ahead, another rise, and another. The nearest was across the stream behind a willow that was like a submerged island. I cast too short, cast again and the ﬂy dragged a little. I waited a while and the ﬁsh rose again. Three more casts and drifts, but no takes. So I moved up to the next ﬁsh that was still rising. My bank this time. I put the Adams up above the ﬁsh; it drifted two feet when again half a snout came out. I saw the ﬁsh turn and half roll and took the rod up. This one put up a lot more of a ﬁght than the ﬁrst one. It dashed out and down, but I was ready and gave it no slack. Twice it tried for willows, one on each side of the stream, but with the 6lb tippet, I could apply pressure. It tried to get down into the thick weed on the bottom but I kept its head up. Gradually I was able to lead it upstream along the bank. I knelt down on the grassy bank and slipped the net under the ﬁsh. This time I decided to keep the ﬁsh. It would be the main course of a meal for special friends. I weighed the ﬁsh after removing the ﬂy, 4.5lb. This one would be photographed when I got back to the car. Another 50 metres upstream and there was another rising. It seemed as though they were stocking up their larders before the storm arrived. I could see the clouds to the south approaching. This ﬁsh was really busy, rising frequently. Again I put the Adams upstream. As it drifted down the ﬁsh rose not more than a foot to the left. It was then that I noticed the very small grey flies that were on the water. This is what they were rising to. It had been sheer luck that the Adams I had chosen was a suitable imitation. The next cast was successful. This time the ﬁsh tried to get in under the bank but there was not enough weed or grass to cause me any problem and with the six-pound tippet it was easy to bring the ﬁsh to the net. A touch over 3lb of hen ﬁsh. This one returned to the water unharmed as well. The next 60 or 70 yards of riverbank had quite a lot of willow around so I just kept on walking past. No doubt there were fish rising in there as well, but it was starting to spit large drops of rain and the sky was quite dark. One last open stretch was ahead of me which would bring me back level with the car. There, about halfway up the straight run, was a ﬁsh busy supping ﬂies off the surface. I watched for a minute or two to note its pattern. A strange thing to me appeared. It seemed that the ﬁsh was pointing downstream as it rose. I crouched down so as not to be seen. The fish’s snout was coming half out of the water just as two of the others that I saw had. But this fish was pointing downstream. I put my line out and dropped the ﬂy above where the fish had been rising. The water was dimpled with raindrops now, but the rise was still obvious. ﬂy and with its snout half out of the water, spit the ﬂy out again before I could hook it. I thought about fishing from above the ﬁsh but gave it away as the wind and rain had become stronger. The ﬁsh would have probably seen me anyway. I turned away from the river and with my one keeper headed for the car. At the car, I did a quick photo job of the catch, stowed the gear and headed home. I had been on the Grays just over an hour and in about 200 metres of water had ﬁshed to five rising fish and netted three. My washed out week had turned out well. Over the next few days, most of the South Island experienced similar storms and some areas were ﬂooded. I felt well pleased with my latest trip to the Grays. My friends really enjoyed that brown trout boned, stuffed and baked in foil. Grays River highlighted in light blue. 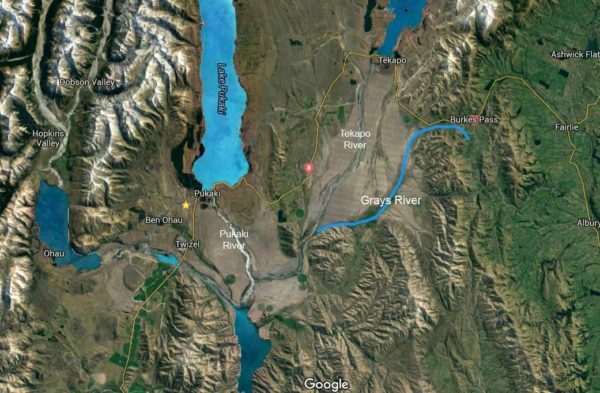 It runs 25 km south-east from the area just south of Burkes Pass, to join the Tekapo River approximately 16 km from the northern end of Lake Benmore. Map courtesy of DigitalGlobe and Google Maps. Open map image in new tab to enlarge.